Leaning is a Go technique, involving contact plays. Leaning moves work because the person being leaned on must respond or suffer a loss. In the process both groups involved in the leaning will be strengthened, but it is another group of the person being leaned on, which is the actual aim of the leaning procedure. A good metaphor for leaning: To take a step with your right foot, put your weight on your left foot first. In the first example below, Black leans on a stone, making it stronger in the process. 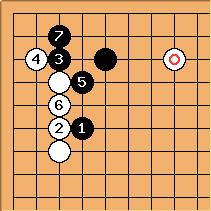 However this shifts the balance of power between the Black corner stones and the single White stone at the top of the board in Black's favour. 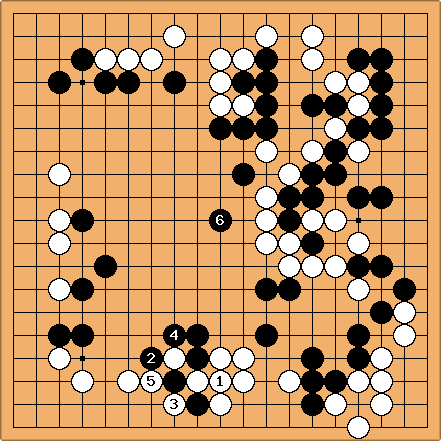 Black can then proceed to attack the weak white stone at the top of the board. 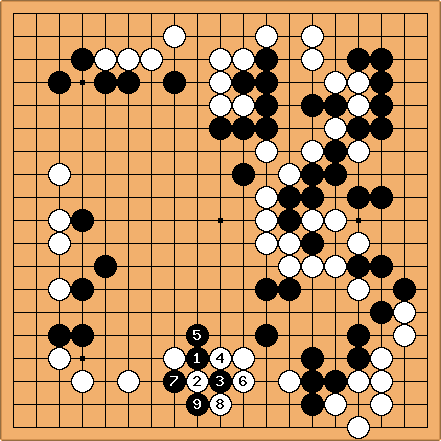 White has played a pincer against the lone black stone. Black leans against the white group in the corner, solidifying his position. Now he is aiming at . and threaten to slice up the bottom side. 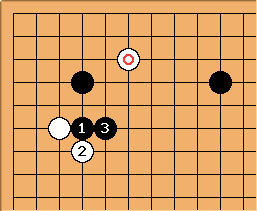 is the key move here, leaning on White to prepare the attack on White's other group. BobMcGuigan: A beautiful example of a leaning move is in the second diagram in Favorite Moment 1, a game between Takemiya and O Rissei.